You know at Caramel Potatoes we’re dedicated to making your life delicious- that’s why we’re so excited about this incredible offer to add something yummy to your fall wardrobe! Shabby Apple is giving one lucky winner $100 to spend on their delicious fashions; and just so no one feels left out, all of our wonderful Caramel Potatoes followers can get 10 percent off by entering the code “caramelpotatoes10off” at checkout (valid for one month). If you aren’t familiar with Shabby Apple you need to hop over to their website and take a look at their vintage-inspired clothing and accessories – remember, what’s old is new again, and Shabby Apple knows how to do it. Don’t forget to check out the scrumptious jewelry and shoes . . . Plus they have maternity and adorable children’s fashions. -Contest ends Sunday, September 23 at 12 midnight CST. -Winner will be announced Monday, September 24 on this blog. Looked as one of the dresses shown on Carmel Potatoes page that would be perfect for my daughter, will have t look closer on the full site. I have previously liked caramel potatoes and shabby apple. Does that still count for two entries? I would pick Aquaria or Bon Voyage. Liked Shabby Apple on Fbook! Liked Caramel Potatoes on Fbook! I follow Caramel Potatoes on Facebook! Love your recipes and tips! I like s.a. on fb as Ki Ip! All of their dresses are so cute, but I really like the Champs Elysees! And I’m in love with the Co-ed skirt. I’d love to buy the Blue Eyes dress. I love the Ming style! I like the Crosswalk Skirt. i love the I’M LATE! I’M LATE! from shabby apple! My favorite dress at Shabby Apple is the Inca Trail. Like Caramel Potatoes on FB! I like the Quipu dress! I like the Window Shop Dress. It is hard to pick just one thing but I am absolutely in love with 2300 and 38 Inches dress. And I like you on FB as well! One of my MANY favorites is the Tigris dress! I like the Beachcomber dress. I’ve had my eyes on the glacier dress forever! I like the i’m late i’m late dress! I like shabby apple on fb as bell martin. I like Caramel Potatoes on FB as Mechele JOhnson. I love the beachbomber dress! One of my favorites is the Ballerina dress. I am already in LOVE with Shabby Apple, I have been a long time fan on facebook. I am new to caramel potatoes, but excited to try some of the recipes, they look great! I have liked Shabby Apple for sometime. I love the Rodeo drive dress and the Syncopation dress! My daughter bought some lovely dresses from them for her honeymoon. like the Red Carpet dress! It is hard to pick only one favorite but today I am in love with the Arripidae dress. I really like the Vineyard Sound dress. I liked Caramel Potatoes on Facebook!! I like the Cusco Skirt!! I like the darwin skirt. I like them on Facebook (Lesha O’Nan). I like your page on Facebook (Lesha O’Nan). I love the Spanish Steps Dress. I love the Arripidae dress. My favorite Shabby Apple item is the Overboard Dress! I like their Oscar Shirt! Cute!! I like Shabby Apple on FB as Susan Chester. The Beachcomber dress is my favorite. I love the Ipanema wrap dress…too adorable! I love the Darwin Skirt! I have liked Shabby Apple! I love the Roma! dress. I love the pizarro skirt! I would totally buy the tuileries dress!! fingers crossed! The El Capitan dress is my favorite. I am in love with all the shoes I couldn’t pick just one! I love the Panthera dress! I like Shabby Apple on FB. Thanks for the awesome giveaway! My favorite is the Arripidae dress. Thanks again. I am in like with the Cecily skirt and the Coed skirt. Too pretty! I love the pineapple princess dress on shabby apple! I love the Coed skirt! I think the Arripidae dress is fabulous! I “like” Shabby Apple on Facebook. I love the Aquaria dress! My favorite dress is the Golden Afternoon dress. Checked out their website…I love their Bon Voyage dress! I love the cockeyed optimist dress from Shabby. My fave right now on Shabby Apple is the blue eyes dress! I’m a fan of SA ’cause they’re awesome! My favorite is the Tulleries dress. The bright yellow is just so darn cheerful! and I’m loving the Pina Colada dress! Thanks! I’m loving the lace dresses! I love the ships ahoy dress most! I love the Polly Hill dress! I love EVERYTHING on this site and have been a fan for a long time…though haven’t purchased as it is a bit out of my $ range. Love the mad hatter line! I like Shabby Apple on FB as Sandy Hardman. I am a fan of Shabby Apple on facebook as Alena Belleque. I am a fan of Caramel Potatoes on facebook as Alena Belleque. I “like” Caramel Potatoes on Facebook! I really love the Hollywood Boulevard Skirt from Shabby Apple! I love their Glacier dress! Thanks so much for the chance! I like Shabby Apple on fb as Dee G.
I like Shabby Apple on fb as Dee G.
I love the primavera dress from the roamin’ holiday collection! I love the 4.0 dress. Tamar Swe is a FB fan. I like Shabby Apple on facebook. Cute cute dresses! I love vitage style clothing, so LOVE this site! So many great clothes, like the telgram dress, the socialite dress, all the aprons…just everything. My daughter is going to flip when she sees the vintage style jewelry. My favorite item is WARRIOR II PANT. like you on fb. thanks! Love the Dainty Doll shoes. they are so cute. 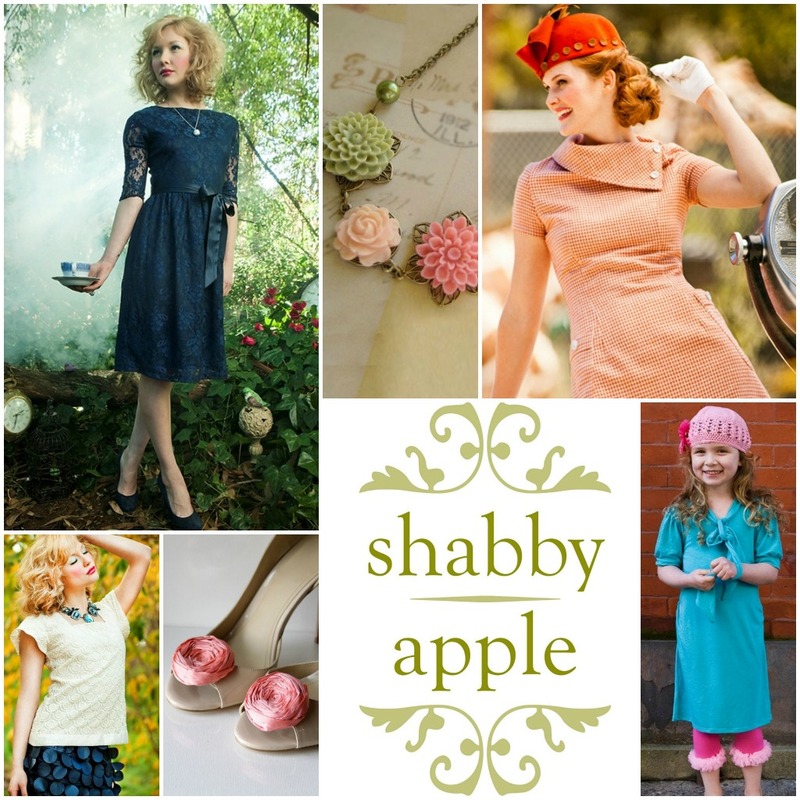 I especially LOVE Shabby Apple’s Dress! Three of my most favorites are the Puca Pucara, Garden Isle and Primavera…So lovely! I love all of the dresses! I double liked them on facebook. Great giveaway. I like Caramel Apples on FB! My favorite SA dress is the Elizabeth Island dress! I love the Backlash shoes! The Scarlett raven is the one for me! I love the look of the Crosswalk skirt! I like Shabby Apple on Facebook as Jodi Brown. Thanks! I love the Gray Fox dress on Shabby Apple. Thank you! i love the jade watch! i love the orchard dress! kelley l likes shabby apple. Like Shabby Apple and Carmel Potatoes on fb 🙂 Love the Ingrid dress! I like the Bianca dress. Love the El Mar dress! The Music Hall skirt is so pretty! One of my favorites is the maxi dress :Piazza Navona. I like the BETTE D.
The Pietra bathing suit is ADORABLE! Looks like Shabby Apple has some really cute vintage, almost pin up girl stuff! Love it! Bring it on back! I can’t wait to dive into these Caramel Potatoes recipes and try the Caramel Potatoes…it sounds super yummy! I adore the CEO dress! I like the Bette D Dress. I love the High Tea skirt…. I feel like it is my new must have! I like Shabbyapple on facebook!